To offset diminishing oil output from Pemex, Mexico’s state-owned oil giant, the Mexican government started implementing landmark energy reforms in 2014, ending 75 years of state monopoly by opening up one of the world’s largest oil and gas reserves to foreign investment. Through a series of private auctions, the government ultimately plans to open up 17% of currently producing oil fields to foreign exploitation and allow foreign companies to bid for the development rights to 79% of Mexico’s reserve fields. While the state will retain ownership of the resources, successful foreign companies will be awarded with either a license, a production sharing deal or a profit sharing deal. According to the original schedule for Round One, 169 blocks—of which 60 are production blocks—are to be auctioned by October, although there could be some slippage in the timetable in reaction to the cutbacks in exploration that oil majors have announced. However, preliminary bidding rules for 14 shallow water exploration blocks were issued in December, and the auction scheduled for July will most likely go ahead (it is expected to generate about $14 billion in investment). Round One, timetabled for 2015, offers a succession of three distinct opportunities for bidders in three regions. The first commences with the 14 exploration oil and gas fields in shallow waters located near the supergiant Cantarell and Ku-Maloob Zaap oil fields. Later in the year comes the more costly-to-develop shale rock Chicontepec formations and tight oil blocks. And, at year-end, blocks in the mostly unexplored deepwaters of the Gulf of Mexico will be offered. Taken together, these 169 blocks cover 28,500 km2. Round One alone offers bidders the opportunity to make a claim to an estimated 3.8 billion barrels of oil reserves and 14.6 billion barrels of prospective reserves at an estimated annual investment of $8.5 billion over four years. Each of these regions represents a significant and diverse investment opportunity that includes producing areas, new and largely unexplored areas in both shallow and deepwater areas, covering both conventional resources and unconventional fields with high prospective potential. The first 14 shallow water blocks remain on schedule since they have the lowest projected development costs at around $20 a barrel and are, therefore, profitable even at current oil prices. In mid-January, it was reported that the energy ministry, in response to low oil prices and cutbacks in exploration budgets, may limit the shale oil & gas and tight oil offer to only the most attractive unconventional resources since extraction is expensive. A decision on what areas to offer and the final timetable is expected in March or April. In contrast, the deepwater blocks have both huge potential and high investment costs, if the American experience on its side of Gulf waters is any guide. However, since it will take at least eight years to develop a field from scratch—and oil majors have long time-horizons—it is likely that bids will be invited as planned at year-end. Lack of information is the universal challenge to all exploration activities. The Comisión Nacional de Hidrocarburos (CNH), which is overseeing Round One, has established ‘Data Rooms’, where oil companies can see available seismic and other data before making a bid. For the initial phase offer (the 14 shallow water blocks), 30 companies have shown interest, of which 7 (including Exxon Mobil Corp., Chevron, Shell, Ecopetrol SA and BG Group Plc) have gained entry by paying fees. For this phase, at least bidders will have some idea of the terrain. This is not the case for the remaining offers. The challenge of these offers is that companies need dependable geological information to identify the best license blocks on which to bid and even more geological data to target blocks that will have the greatest potential for an economically viable petroleum system with the lowest exploration and production risk. Unfortunately, much of that information is not readily available, accessible or even digestible in its current form. Nevertheless, the attraction of a prospective 115 billion barrels of oil equivalent may, despite the lack of information, prove this round to be potentially one of the most expensive bid rounds in history. Companies will be focused on the long-term strategy of their investments when bidding and are prepared to heavily quantify that commitment. For such a resource, bidders will be in it for the long game. 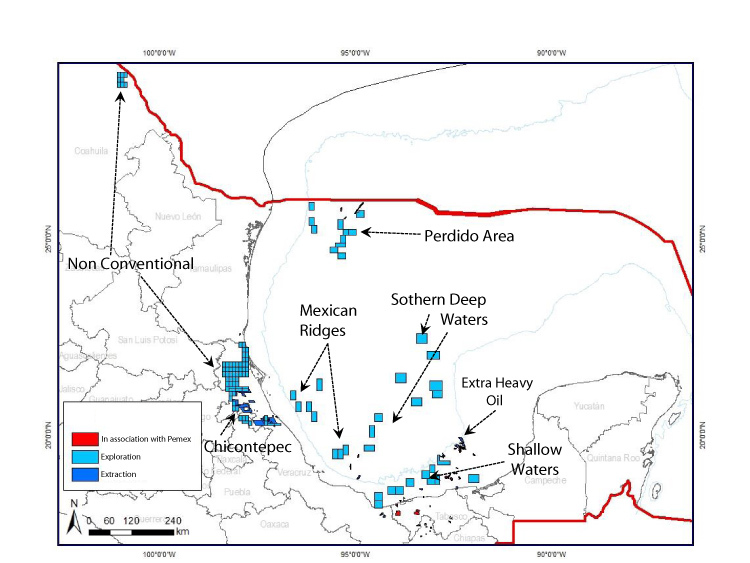 Another factor influencing this gold rush is the history of success in Mexico’s shallow waters, most notably the presence of the supergiant Cantarell Field, which was for many years the second largest oil field in the world due to the area’s favorable petro-geology. In Mexico, deltas with beach sands have proven to be very strong locations for finding oil. The highest success rates—exceeding 25%—have historically been in the shallows where such sands are located. This knowledge further fuels the frenzy and justifies higher and higher bids. Many challenges face any company wishing to participate in Round One. They can be classified into three general groupings, as listed below. But the overall effect of these is that the lack of definitive information means decisions are being guided by guesswork. The challenge of variables: What will the Mexican government and the oil industry do? Both the government and the bidders are operating partially blindfolded in a tough environment, full of uncertainty–about the depth to which the oil price will sink, how long it will stay at the bottom and to what level it will recover. The bottom line is that both the government and the oil companies want the oil to be extracted and sold on world markets. On this basis, the question is: how responsive can the government afford to be to the prevailing low oil price? Can it make allowances for the cost of exploring and developing different assets while at the same time getting the best possible price for its oil and gas when its central objective is to finance the country’s industrial development? The current expectations for Round One are that the first half of 2015 will be set aside for registrations to bid, followed by the awarding of projects in July and again towards the year end. The provisional timetable for Round One bidding has been revised and may well be again since, according to Pedro Joaquin Coldwell, Energy Minister, the ministry of energy “is evaluating the restructuring of the Round One auctions in the areas of unconventional oil, shale gas and shale oil” (Bloomberg Business, 16 January 2015). Whatever the case, the pressure is on to rapidly acquire usable actionable information on which to base bids. A compounding challenge is that no one is certain how many rounds of bidding there may be. While five rounds have been announced, there is speculation about whether these will actually take place. Furthermore, while preliminary bidding rules have been announced in anticipation of feedback from potential bidders, the actual terms and conditions of the licenses have not been released either, adding to the bidding blindness. A “local content requirement” fixing the provision of goods, services and labor at an initial 25%, increasing to 35% in later years, will probably be maintained. However, the requirement that bidders must have a minimum of $1 billion in assets might be subject to revision depending upon the degree of interest from bidders and expectations of the oil price. The government ‘take’ in terms of royalties and tax is to be announced closer to the bidding round according to the Minister of Finance. Further, the contract terms for mature fields, where oil has been discovered but production has fallen, and for unconventional oil and gas as well as the deepwater blocks of the gulf are promised soon. However, the contract length for the first blocks will be 25 years with two extensions of five years each. These conditions can have significant impacts on a license, determining how many drilled wells will be required, given that a deepwater platform can cost between $1 and $2 billion, that wells cost $300 million to drill and that a system of pumps and processing equipment on the seabed can add another $100 million over a 5-10 year investment. In addition, there is uncertainty about how long a company can keep its allotment without having to develop or drill, and whether large companies will be required to collaborate with smaller ones. Finally, the entire oil industry itself is experiencing the currently low oil prices, leading to cut-backs in exploration budgets by many companies, especially in marginal projects. However, that industry mindset is for the near-term. Companies will be focused on the long-term strategy presented by the Gulf opportunity. It is believed they will be willing to take large investment risks today in the hopes that they will pay off tomorrow and for decades to come. Indeed, some reassurance is provided in the recently published BP Energy Outlook 2035, which envisions that the current supply glut in oil will fade as US production slows and that the world’s demand for oil will recover and grow by around 0.8% each year to 2035. Whatever seismic information exists—and there is not a great deal—is in the hands of Pemex. Seismic information is crucial to oil and gas exploration and drilling, and much of the Gulf is uncharted territory. Unless companies can get this information and integrate it quickly, they will be bidding from a basis founded on a highly obstructed view. Mexico recognizes the importance of seismic surveys and will be issuing separate bids for companies to do these surveys. Similar to ultrasounds in medicine, seismic studies capture information about rock types and their locations, and then pinpoint the size and location of reservoirs. At best, one may guess that the seismic studies will be conducted concurrently with the bidding for Round One, which reduces the amount of time for analysis and risk assessments. Given the little amount of time available, it is virtually impossible for this round of bidders to conduct 3- and 4D seismic surveys. For this bidding round, there are huge gaps in information with extremely limited time to gather new data to make predictions as to the best lots to bid on. Nevertheless, even if new data can be collected, the job is only half done. It must then be consolidated and integrated in order to have meaning and be properly analyzed. Unfortunately, this is a very time consuming process. When done by the individual geophysicist, files must be converted one at a time into a standardized format and then integrated in order to have value. If the data is collected secondhand, however, the geophysicist still needs to confirm its reliability to make sure that the analysis will provide useful and actionable information. Due to the time constraints associated with the Gulf of Mexico bidding, it will be extremely difficult to do this the correct way, with no time for do-overs. While this solution seems obvious, it’s not so easily put into practice as discussed above. Not only must the data be collected and synthesized, it must also be made seamless with tools that geophysicists use. This takes a lot of time. Companies will almost certainly need to rely on a variety of information sources and tools to gain a competitive advantage in the bidding process. Outside services and resources such as Geofacets, Neftex, EDIN, Enerdeq and AAPG, in addition to many others, provide tools that access the information being sought in real time. Most of the data access, restructuring and integration issues discussed above are eliminated through automated integration features, providing a huge time savings and allowing scientists to go straight to analysis. Importantly, maps and other facets can be quickly obtained using keyword and location-based searches, while strategic search filters allow users to narrow down to specific areas of interest. These tools can save companies valuable time, and, when based on trustworthy, credible sources, increase the confidence in bidding decisions. One pathway to success is to take control over any information that’s available and process it to produce actionable results. This means quickly obtaining available geological data in a usable format for analysis. This action increases the probability of an accurate prediction as to the location of the most fertile blocks. Another option is to grab or bid on blocks just to get into the game. Once a company has licensed the blocks, it can choose to develop the blocks or to hold off for as long as possible, while waiting to see how companies with nearby blocks develop their parcels. By doing this, a company can watch and learn and then make an educated guess as to the value of its holding and whether or not to develop/drill. However, if both companies employ this strategy, then discovering the true value of your costly bid becomes a high-stakes game of chicken. 2015 is already shaping up to be an exciting year for companies interested in developing the Gulf of Mexico. While finding oil and gas resources is never a sure thing, how the numerous time and data challenges are strategically dealt with will help to determine who obtains the best parcels and declares victory for 2015 and beyond.